In a world of quick-fix this and drive-through that, sometimes it’s nice to slow things down. Toni Okamoto—creator of the popular site Plant Based on a Budget—has done just that her new book, The Super Easy Vegan Slow Cooker Cookbook. And lucky for us, Toni is sharing one of her favorite recipes from the cookbook here on World of Vegan! If you have a slow cooker on hand, dust that puppy off and whip up some of this creamy slow cooker red curry. 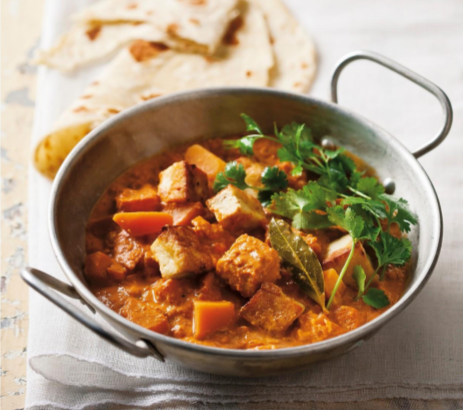 With just 15 minutes of recipe prep before you head to work in the morning, you’ll come home to the sweet aroma of fresh curry and a hearty meal waiting for you. In the typical Toni Okamoto fashion, this curry is easy to make using widely accessible and affordable ingredients, many of which you’re likely to have already in your kitchen. So what are you waiting for? Go, go, go! 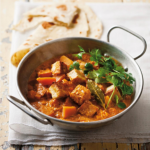 This simple curry is comforting and gently spiced. The sweet, mild flavors of this dish with its creamy coconut milk sauce make it a great “beginner’s curry.” Give it a try! In a skillet over medium-high heat, heat the oil. Add the tofu and brown until the edges are crisp, about 5 minutes. Combine the tofu, baby carrots, potatoes, onions, garlic, ginger, water, coconut milk, red curry paste, bouillon cube, and salt in a slow cooker; mix well. Serve over rice and garnished with cilantro. Ingredient Variation: Using baby carrots cuts down on prep time, but if you don’t have them, just use peeled, chopped regular carrots. You can find many more innovative vegan slow cooker recipes from Toni Okamoto in her cookbook. Enjoy! Recipe and photo from The Super Easy Vegan Slow Cooker Cookbook by Toni Okamoto.